Chicory coffee doesn't stain the pot? 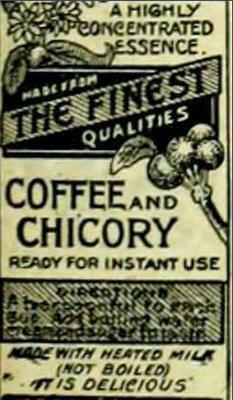 Old brand of chicory coffee. I am in New Orleans and we have chicory coffee. We have thermos carafes in my office. Regular coffee goes in one and chicory coffee goes in another and about the same amount of coffee is made in both. Occasionally I clean the carafes and notice the silver interior of the regular carafe has a brown coffee stain but the chicory carafe is shiny clean. Does anyone know why there is a difference? Intriguing question! : ) I’m assuming both carafes are of the same age, and have been in use for the same period of time. And I’m also assuming that the regular coffee always goes in the same carafe. Ditto the chicory coffee. Beyond that, I’m stumped. I have researched on Google, read countless pages about chicory. But can’t find anything about any anti-stain properties it might possess. Maybe someone else knows, and get enlighten us. Comments for Chicory coffee doesn't stain the pot? I'm going to switch carafes and see if the chikory coffee cleans out the regular carafe. That test will verify that there is some kind of "cleaning agent" in the chikory coffee. I have also done the google research and found nothing. I emailing Community Coffee with the same question and awaiting an answer.